Secretary Panetta makes a point at a Club luncheon. 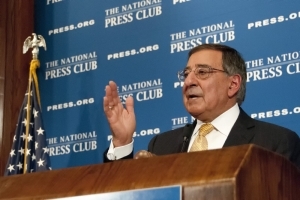 Secretary of Defense Leon Panetta used a Dec. 18 National Press Club luncheon to urge Congress to “do the right thing” by avoiding the across-the-board spending cuts of the “fiscal cliff” and approving the defense strategy contained in the Defense Department’s budget proposal. The fiscal cliff refers to the more than $600 billion in automatic spending cuts and tax increases scheduled to go into effect beginning next month unless Congress acts. While Congress talks about cutting spending, Panetta said there are plenty of areas at the Pentagon where funding can be eliminated without hurting U.S. defense capabilities. “Aircraft, ships, tanks - even those that have outlived their usefulness - have a natural political consistency; readiness does not,” he said. He expressed concern that the 2013 defense authorization bill diverted $74 billion of savings the Defense Department had proposed to other areas “that frankly we don’t need.” He said he is working with Congress to “improve” the bill. Implementing the strategy will cut expenditures by $487 billion over the next decade, including cuts in military forces. The “era of blank check defense spending is over,” he said. The military is at a strategic turning point after more than a decade of war, he said. He reminded the audience that the last convoy of soldiers crossed out of Iraq a year ago. In Afghanistan, “we have fundamentally turned the tide,” he said. However, he warned, the threats to US security and global interests are not receding, as they appeared to do after past wars. They are complex, diverse and in many ways more dangerous, he said. He noted that North Korea and Iran continue to pose nuclear proliferation threats, destabilizing their regions. Conflict in Syria threatens large stockpiles of chemical and biological weapons, he added. He identified the goal of the new defense strategy as adapting forces and concepts for an unpredictable and dangerous future. The smaller force will be agile, flexible, technologically advanced, and able to deploy quickly, he predicted. The strategy includes the capability to confront more than one adversary anywhere at any time, he said. According to Panetta, the plan is not just about cutting spending, but also about investing in the future with new technologies and capabilities. “It is not simply a budget exercise,” he said. He identified unmanned systems, cybercapability and special operations forces as areas for investment. Special operations forces will reach 72,000 by 2017, more than double the number on Sept. 11, 2001, he said. Unmanned systems will include carrier- launched surveillance and strike aircraft, he said. Cybercapability will expand, particularly manpower, he said. The plan also protects the military’s ability to “regrow” by emphasizing the National Guard and protecting the U.S. industrial base, he said.